Komandor has been Canada's the leading retailer of custom quality interior millwork. 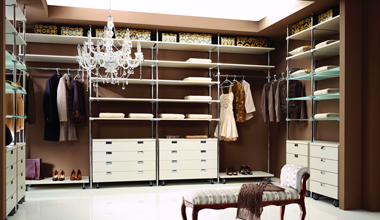 From custom walk-in closets, sliding doors and cabinetry, to our aluminum room partitions and murphy beds, Komandor has the best products for your home at the right price. Established in Europe in 1992, Komandor’s Greater Toronto Area (GTA) Showroom and Production Facility, located in Mississauga, Ontario opened its doors in 2002. For more than 13 years, we have been Toronto’s best retailer of custom closets, doors, accessories and interior millwork. We will continue to be the best designer and manufacturer of custom interiors because we remain dedicated to realizing our clients’ designs and always make the highest quality products, such as closets, closet-doors, Murphy beds and kitchen cabinetry. Our custom, and ready-made products, which range from walk-in closets, kitchen and specialty cabinetry, to Murphy Beds and sliding doors are designed and engineered to meet demanding quality expectations. From maximizing condominium living space, to high-end walk-in closets, Komandor has the right solution for you, at the right price. However, just producing Toronto’s best storage solutions is not enough. Komandor’s team of experienced interior designers and expert installers ensure all clients receive a level of customer service only Komandor can guarantee. For these reasons, Komandor Custom Closets and Doors’ operation is ISO 9001 certified, and our custom closets and doors can be found in leading homes throughout Toronto.